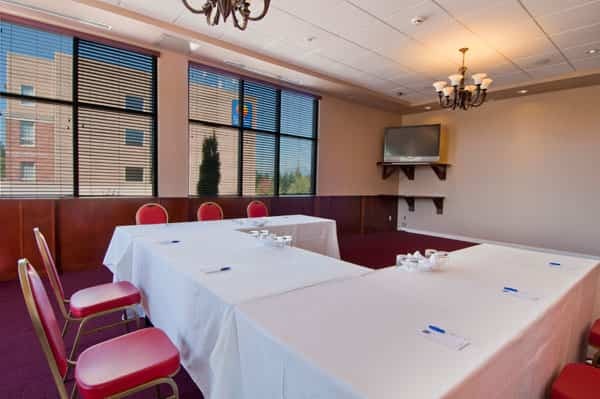 Featuring corporate and group rate packages, the Comfort Inn & Suites Surrey is your number one choice for a corporate event and function. With state-of-the-art AV equipment options, meeting rooms and a large conference space that holds anywhere from 10 to 200 people, our hotel exceeds the expectations of our corporate guests. When you are searching for a corporate hotel in Surrey, look no further! Our popular hotel will satisfy the boss, corporate team and offer you with everything you need to make your corporate event an absolute success. Why wait any longer? We are ready to help you organize your next corporate and group event. We take the stress out of business travel with features that help you relax and stay productive. Our guests can entertain clients at our onsite restaurant and pub and connect to the web with free Wi-Fi, and stay active in our spacious indoor pool and fitness facility. Whether you’re hosting a small meeting or large seminar, our conference facilities offer your choice of three well-appointed rooms, equipped with modern A/V technology and configurable to suit the seating requirements of your guests. Get in touch with us today and one of our sales representatives will be happy to put together a group accommodation package to suit the needs of your team and the budget of your organization.